Like frosted flakes, it’s kinda sugary and far from the worst thing out there. But it’s not the best choice, either. Here’s the plot (from IMdB). Fearless optimist Anna teams up with Kristoff in an epic journey, encountering Everest-like conditions, and a hilarious snowman named Olaf in a race to find Anna’s sister Elsa, whose icy powers have trapped the kingdom in eternal winter. Not being a 12 year old girl, it’s difficult for me to like this movie. It’s not bad – it is Disney after all – but it has 5 things that doom it for a geeky guy like me. 1) It’s about princesses. Not pirate- or hobbit- or cyborg-princesses either. Just princesses. In princess dresses. Doing princess things. Thinking princess thoughts. Ack. 2) There is singing. A lot of singing. Some of the songs are cool but why have a song when you can have a dragon eating someone? Or at least threatening to eat someone. 3) This, to kinda quote the Princess Bride, is a kissing movie. Now I’m not really against kissing movies, but at least Princess Bride had a funny, highly quotable Scillian villain (“You fell victim to one of the classic blunders – The most famous of which is “never get involved in a land war in Asia” – but only slightly less well-known is this: “Never go against a Sicilian when death is on the line”! Ha ha ha ha ha ha ha! Ha ha ha ha ha ha ha! Ha ha ha…” plop), Inigo You-killed-my-father Montoya and Miracle Max. It was so much more than a kissing movie. This is not. 4) Where are the memorable quotes, I ask you, where? All of my favourite kids movies have epic quotes. Kung Fu Panda “We do not wash our pits in the pool of Sacred Tears.” Up. “Squirrel!! !” Toy Story “To infinity and beyond!” The only quote I can remember is Anna – “Olaf, you’re melting!” Olaf the Snowman – “Some people are worth melting for.” Cute, right, but not epic. Not something I’ll likely quote at biker rallies or in MMA bars. 5) Once again, the parents die. What the m*therf*ck is wrong with Disney that they have to kill off the parents? There is some serious therapy needed at this international super-corporation. On the plus side, it has 5 things to recommend it. 1) Crazy good graphics! Check out the snow (while you listen to someone sing about something.) Look at the way the light plays off of the walls of the ice castle! 2) The sidekicks rock. 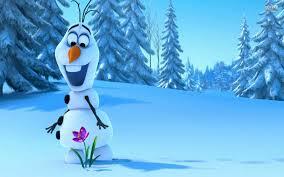 The snow man who sings of seeing the sun and doing things that snowman do in the sun is funny and heartbreaking. If Disney does one thing well, it’s usually their supporting characters. 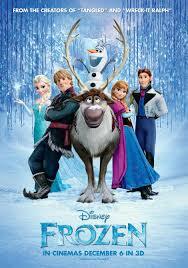 Without Olaf the snowman and Sven the reindeer, this movie would be an epic fail. 3) Popcorn was good. And buttery. A movie is so much better with buttery popcorn. Disney should give this away for free. My reviews would be kinder. 4) It’s not that turkey movie about turkeys trying to save turkeys from being turkey dinners. When all else fails, realize there are way, way worse movies out there. 5) It has a good moral message. All kids movies should, imho. I won’t spoil it, as much as I’d like to, so just know that these Disney folks, they not only love a happy ending, but one that should create better little human beings. Me, I’m too old for that stuff and in no way got a bit teary at the end, no, that was allergies and popcorn butter in my eye. So, if you want to check out a few more reviews, look at Rotten Tomatoes. Most of them totally disagreed with me. But if you want my opinion, it’s not a bad way to spend a Saturday afternoon with kids under 12. Boys may find the lack of cars, fighting robots or fire-breathing dragons a big problem. I know I did. This entry was posted in Movie Review and tagged Anna, Disney, Disney movies, Frozen, Kung Fu Panda, Olaf the snowman, popcorn, Princess Bride, Sven the reindeer, To infinity and beyond, Toy Story, Up. Bookmark the permalink. I think R will like this then. Princesses, singing, & buttery popcorn, Hurrah!!! Carter, age 6 gives it 8/10. Jackson, age 11, 7/10. Joe, age 1,000,000, 5/10. Corinne, princess, 9/10. 1. There are only two princesses – both strong characters and deeply conflicted. Everyone else are male characters! And I believe Trolls should count at least part way towards Hobbits. 4. This is NOT a kissing movie. Did you miss the ending entirely? It’s about SISTERS! A+? What? OMG I so do not get girls sometimes. I agree completely about #4…. MY FAVORITE PART!!! So adorable! I totally gave it a 5/5! Any resemblance between this and Anderson’s “The Snow Queen” which I read somewhere that this is “based on” is born either of serious reality altering drugs or a delirium brought on by a high fever. That said, it looks cute. I’m not a big Disney fan anymore, but I might enjoy this. Thanks Joe. It is cute. No doubt. My mom LOVED this movie. She phoned me to tell me she LOVED this movie. My mom does not normally feel this way about movies. And The Snow Queen is one of her all time favourite stories.